Madison ABC Annual Meeting—You’re Invited! Stay tuned for information on the 2018 Annual Meeting, June 2nd at 7:30 at the Surf Club! Please join us Sunday, June 4, 2017, at 7:30 pm at the Surf Club to experience the heart and soul of Madison ABC at its Annual Meeting. This year we will welcome author, filmmaker, and interpersonal communications coach Allen Paul Weaver III as our speaker. Allen holds a Bachelor of Arts in Mass/Speech Communications and a Master of Divinity degree. He brings 30+ years of personal and professional experience into focus with his skills, gifts, and talents as he works to inspire, motivate, and educate audiences of all ages. Allen loves helping others move toward their purpose and believes everyone has at least one book in them! 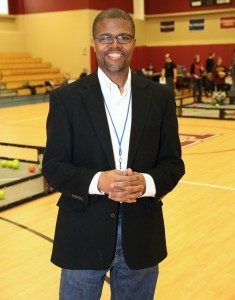 He is the author of the Speedsuit Powers Trilogy (YA fiction) and adapted Book 1 into a live-action independent film titled Speedsuit. He has published two other books (Transition and MOVE! Your Destiny Is Waiting on You) and is currently working on additional manuscripts. His video production work has taken him across the United States, to Europe, China, and seven African countries. In his downtime, Allen enjoys drawing, watching movies, reading comic books, and vertical wind-tunnel flying. He lives in New York with his wife and son. After Allen’s address, one of the highlights of the year happens when we will present our returning scholars— Delvantae Hutton, Josh Cabral, and Jordan Rivera—and introduce our new scholars who will join us in the fall. We will conclude the evening with a celebration of Malachi Dixon-Powell and his four years with the ABC program.